Heard or Herd – What’s the Difference? Home » Heard or Herd – What’s the Difference? Homophones are words that sound the same but mean different things. They might even be different parts of speech. Heard and herd are homophones that can both function as verbs, but only one of them is a noun. Do you know which one it is? If not, don’t worry—you can read the rest of this article to find out. What is the Difference Between Heard and Herd? In this post, I will compare herd vs. heard. I will use each of these words in at least one example sentence, so you can see how they appear in context. Plus, I will show you a helpful memory tool that will make choosing either herd or heard much easier in your future writing endeavors. What does heard mean? Heard is a verb. It is the simple past tense form of the verb to hear, which means to perceive auditory sensations. Marvin Gaye heard it through the grapevine, which means he heard it while listening to someone gossip. Jenny had been planning to ask Mark to go to the dance with her, but when she heard Marie ask him, she went to the bathroom to cry instead. To find out about here vs. hear, see here. What does herd mean? Herd, can be a verb or a noun. A herd is a group of animals. Many animals live in herds, like bison, cows, and zebras. The alpha male antelope wanted to go to medical school to become a neurosurgeon, but decided to stay for the good of the herd. Herd can also be used as part of a compound word that means one who tends to animals. A shepherd, for instance, watches sheep, while a goatherd takes care of goats. When herd is used as a verb, it describes animal behavior related to grouping. Animals who gather in groups to live out their lives are said to be herding. If you introduce several individual cows into the same pasture, they will herd together and stay in a group. If you want to use either of these words as a noun, you should choose herd, since heard is never a noun. They can both be verbs, though, so your choice in this context is more difficult. 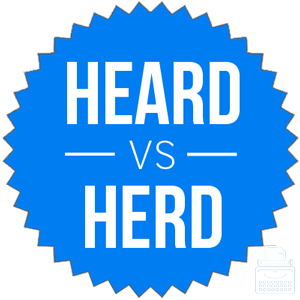 Remember Heard vs. Herd: Heard is a conjugation of the verb hear, which means to perceive auditory signals. Since heard and auditory each contain the letter A, using heard as a verb in the context of hear is an easy choice to make. Is it heard or herd? While these two words are homophones, they are never interchangeable. Heard is a past tense verb that means having perceived auditory information at some point in the past. Herd is a verb that means group together and a noun that means a group of animals. 1 What is the Difference Between Heard and Herd? Himself or Hisself – What’s the Difference?